in a clearing. You then need to turn right to find a rough track which goes uphill between newly planted trees and mature forest. At the end of the track go through a double gate and follow a fence uphill through moorland. After a few minutes cross the fence and bear left uphill to reach the summit. This is marked by a variety of poles of different lengths and what appears to be the remains of a corrugated iron shed. This was the first time I attempted a Hill or Mountain climb. I enjoyed the experience, a great way to work off the Christmas Day excesses! I, along with two companions, headed for the top at 10AM on St Stephens Day. We parked outside the UL Activity Centre and headed up a small road.This road is approximately 80M at the Scariff side of the entrance to the Car Park mentioned in other posts. Using an OS Map, we followed the Public road for approximately 20 minutes.As it turned right and sharply down-hill, we left the road and followed a walk-way uphill(This really gets the Heart pumping!) We followed,in general,walker_holics directions,along with the OS Map, until we came to the Fire-break. This had recently been cleaned out and was extremely wet.We made a temporary bridge with some tree-branches that were cut from the fire-break. When we had a clear view of the top, we noticed two Walkers who had reached the top and were heading home. I took a few pics when we got up there. 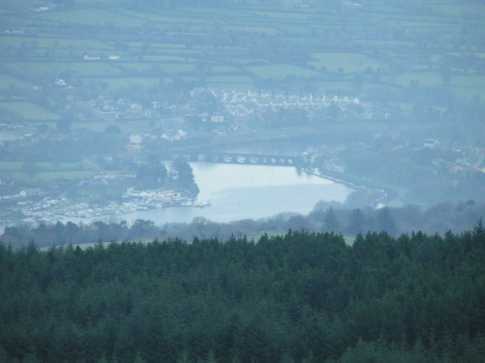 I attach one with a view of Killaloe and Ballina. I will add another picture at a later date of the fire-break that was posted by murphysw, taken from the top,including the gates mentioned in walker_hollics directions. It was a beautiful day for a climb,we wore walking boots and didnt see any requirement for wellingtons. Perhaps, after a lot of rain, conditions could differ. There were some great views of Killaloe,Tipperary,Lough Derg and Ardnacrusha from the top. I have a couple of nice pics with puffy clous below us as we relaxed at the top. Its a terrible pity that the remains of the shed,generator and batteries have been left there. Mind you, its a good indicator that one has reached the top, as its very flat and there are a few areas that seem to be a little higher all around, though, when we got to one, it looked lower than the area we had left.One word of caution. It can be quite cold at the summit. The cool wind that blew in from the Lake had us perishing within minutes! 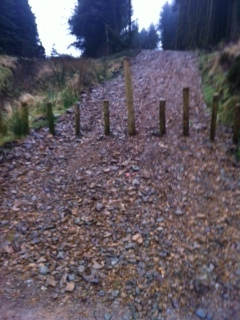 The climb back down is a lot easier on the body, a perfect way to "Warm-down" after the exertions of the climb up. 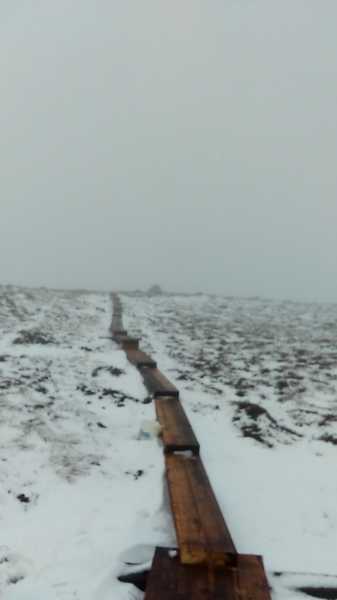 I hiked Moylussa on a snowy Saturday(16/01/2016) with my son Darragh(plus Buddy the dog) and was delighted to find that a boardwalk has been constructed from the end of the rocky path, across the bog to the summit stone. I don't know which organisation is responsible for this magnificent work but anyone who has previously crossed this quagmire will appreciate this facility immensely !